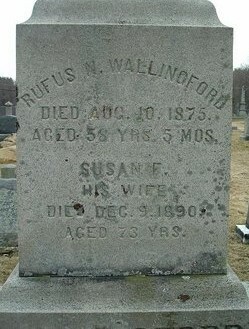 Deputy Sheriff Rufus Wallingford was shot and killed shortly after midnight near the fairgrounds one-half mile south of Milford, New Hampshire. His body was found shortly after 5:00 am suffering from a gunshot wound in his chest. His revolver was found nearby and his wallet was missing. A package of writs he was serving was also located near his body. Deputy Wallingford was survived by his wife, daughter, and two sons. At a time when many of us are ready to retire, you were out serving papers. Deputy Wallingford, you are truly a hero and I am very glad and we are all fortunate that your sacrifice has been discovered and posted here so that all will know. I hope and pray that those who came after you, at work, but especially within the family, know and learn about your sacrifice and appreciate what you did. Brother, God Bless and may you forever and always, Rest in Peace.